So I couldn't resist making another card for the Embellish challenge... these colours are really delicious. Today I tried out THIS Vinnie Pearce digikit. I love green, and this paper is my favourite in the kit. 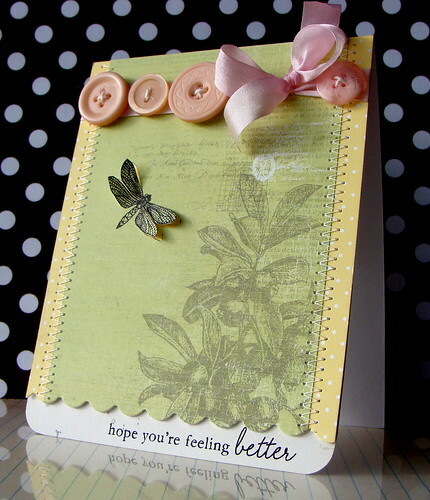 Supplies: Papers - Vinnie Pearce and PTI; Stamps - Hero Arts and PTI; Buttons - unknown; Ribbon - Creative Impressions; Twine - PTI. Loving my new Papertrey goodies - the polka paper and twine are gorgeous, and the Everyday Buttons Bits stamp set has the most adorable sentiments. Happy Monday - hope your week has got off to a good start. Ok, I just squealed when I saw this on flickr. WOW! You really did justice to the challenge colors, so beautiful! ahhhh... I love those colors, too! and you made them into such a pretty card! love love love this one, Lucy! One can see that those are your favorite colors! Beautiful card, great take at this challenge! I'm stuck with the peach one though, must look thoroughly through my stash... or dig into the digi!!! This one is gorgeous. You are really an enabler with these digi papers. Beautiful! !as always!! you are amazing!! hope you have a nice day too!!! Oh my! This color combo has your name all over it! LOVE what you did with this color challenge! lovely card ... yes, I love that button bits set too! Mmm...like candy to the eye :D Beautiful! LOVE this Lucy.....so VERY Pretty!!!! AAAAAhhhhhh - 'tis a work of art! What a beautiful beautiful card! I love the combo of vintage and modern. I just found your blog and love all your work! I am interested in finding out about the digital approach to printing background papers. Do you have a 12 x 12 printer? Can the paper be downsized to 8.5x11 without distortion? Can the colors be changed easily? So many questions... Thanks for the help. This is ADORABLE - yummy colors Lucy! 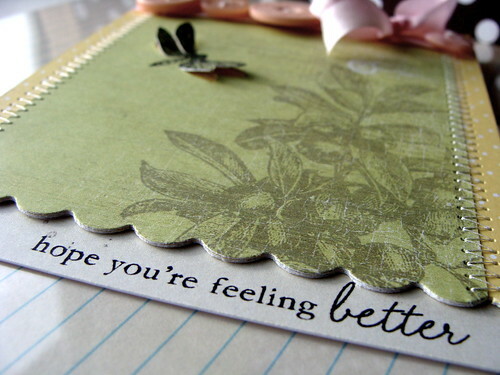 This is really cute...you have inspired me to get my stamps and paper out and get going. Thank you. Lucy - this is such a great card! Love the peeking sentiment! Thanks so much for joining in on the Embellish Challenge! WOW!! LOVE this. I am a first time visitor to your blog and will have to definitely check out the rest of your work. Thanks for sharing. I feel inspired already to get creating! Stunning! I think I need to open my eyes to digital---that paper is gorgeous. The digi paper is fabulous! Your card...gorgeous! Thanks for playing along with us! My goodness, this is a gorgeous card. The colors, the soft image and the stitching!!!! Love it! I just adore your work! You amaze me!! Thanks so much for playing along with us at Embellish! Congrats on being featured in the Embellish borders challenge! Your card is gorgeous! Beautiful card. Love your stitching! So even and straight. (not my favorite thing to do) Congrats for the shout out on Embellish Magazine.